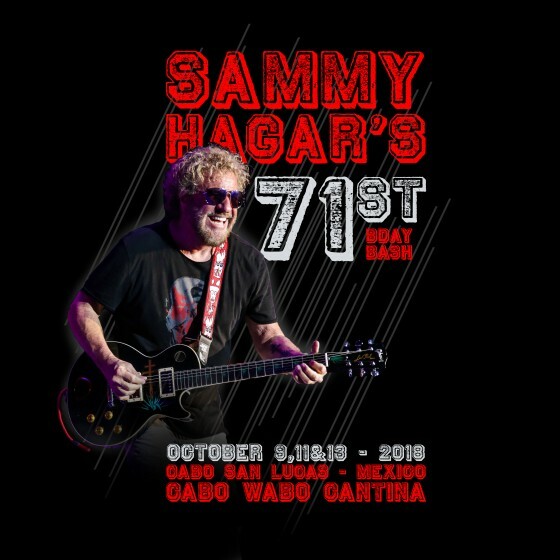 As in years past, there will be a limited number of Dinner Show Tickets available directly in Cabo San Lucas, Mexico at the Cabo Wabo Cantina. Tickets will be sold on a first come, first serve basis in Cabo. Night 1 (Oct. 9th) Tickets will be made available at the cantina club area at 12pm noon on Monday, October 8th. Night 2 & 3 (Oct. 11th & 13th) Tickets will be made available at the cantina club area at 12pm noon on Wednesday, October 10th. Dinner Show Tickets will cost $120 per person and include a welcome drink, dinner, tax, tip & admission into the show. It does not include any additional drinks. Dinner Reservations DO NOT GUARANTEE a table for the show. The show will be standing room only. There are no tables or chairs. Maximum of 2 seats per person present for the purchase. Please have valid photo ID ready. So if I’m not in Cabo by the 10th, then I can’t get tickets at all?? I gave tickets for night one but don’t get to Cabo until Monday afternoon. Is there a way to get dinner reservations? My wife and I are going to the October 9th show. CAN'T WAIT!!! What time do people typically start lining up to get in? I guess they start lining up even before they get their wristbands at 2pm? And once inside the venue, it's standing only? There are no chairs? What is the approximate time Sammy comes on? Is there an opening band? If so, what time do they start? I know! A lot of questions! THANKS. See you soon!!!! You should have gotten an email confirmation from EventBrite. This was the official company who handled ticketing. THEY ARE NOT OUT OF BUSINESS. Did you buy from the internet sale or win in lottery. I need 2 tickets for the October 9th show! Only in town for this show. Please contact me at N.pace@comcast.net if you have extra! Thank you! Good vibes to all! We are flying in, in hopes of acquiring 2 tickets for The Birthday Bash! This is the only show we will be in town for,sadly. We have been loyal patrons for years and grew up not far from Fontana, even have mutual friends with Sammy! We are flying into Cabo for this show! Need 2 tickets! Hope luck is on our side this time! Putting out the good vibes! Cool, thanks for the info! We'll be there anyway so will def scope it out. The reference for Wednesday is pertaining to dinner/show tickets. These are not regular tickets won from the lottery or the special internet sale. If you got tickets by one of those methods then wristband(s) pick up is day of show around 2. If you have a guest make sure that person is with you, and if your the guest make sure you are with the winner. They verify winners against a manifest, and then attach the bands. DO NOT TAMPER WITH THEM. They will check for that and if they suspect it then no entry will be granted. If you have regular tickets you can't also get dinner/show type. There will be fans camping out minimum an overnight on the sidewalk to get this type. If you have any other questions ask away. I need to confirm when Night 2 Will Call Check-In occurs. The winner has to be there in order to get the tickets. The way the ticketing works is they have a winner manifest and at the time of pickup they are verified to be a winner on the manifest. These actually are not tickets that term is used loosely, but wristbands that are put on at the time of being verified. You could however find someone that won two and are solo and be the guest. Would it be inappropriate to use this forum to request contact if anyone can't make one of the b-day shows at last minute?? Had already planned the trip but wasn't fortunate enough to get in on the lottery tix. *Not looking for a handout but also not looking to propagate ticket scalpers/scammers...just wanna celebrate me, my big bro's AND Sammy's bdays all at once! Redrocker327, again appreciate the info. Bummer as I don’t think I would fare well sleeping outside. Love ya Sammy, but that’s gotta be rough :). You mentioned there are seating times. Will these be assigned automatically? If you have show tickets you can not also get the dinner/show combo type for the same show. You can attempt to get dinner/show type for shows you do not currently have them for. You will need to allocate at least a 24 hour camp out/sleeping on the sidewalk of Cabo Wabo before the on sale to have a chance. There have been years it took 48 to 72 hours. They have two or three different seating times. I hope this answers your question, and if you have more ask away. Hey redrocker327, appreciate all your info here. Still had a question though about the dinner part though as this is my first time heading to Cabo and was fortunate enough to get to tix for. If I wanted to do the dinner as well, will we be provided info for that prior to going? My wife and dive and were looking to do some diving while out there and wasn't sure if we had to get there really early. So any info you have on that and what time you think we need to arrive on show day for ones with tickets already would be greatly appreciated. Thanks! You can get them by three methods. The first is via a lottery drawing that they conduct. The entry period is usually June and the drawing in July. The information about this is posted on Sammy's social media pages. The next method is an internet sale of tickets not bought by lottery winners. This information is also posted on social media pages. The last is by waiting in line for dinner/show combo ones. This type you have to camp out on the sidewalk of Cabo Wabo anywhere from 24 to 72 hours before the on sale to get. These are the traditional ways. You can also find someone with an extra ticket and be their guest. Your welcome. If this is your first time and you have any questions let me know. This year will be my 11th. thanks for the info...yup, bringing my guest! This is just a different type of ticket from show only. This type gets you dinner before the show and a welcome drink. You also generally are allowed up front over show only type. It is the same show. There is typically at least a 24 hour sleeping on the sidewalk before these type go on sale to have a shot at getting them. I know of years it took 48 to 72 hours in order to get them. Do you have a guest already? These tickets allow you to have dinner before the show along with a welcome drink. The show is the same it is not a special one. Those with this type of ticket also are generally allowed up front. You can not have both types so for you since you already have show tickets no need to go after this type. I have tickets for 10/09....will be there all week, but: What the hell is a "dinner show"? Is that like, dinner and show? Opener? please advise..
Is this different than the concerts? We specifically planned our 25th anniversary in Cabo to try to attend one of the shows not realizing how impossible it is to get tickets. If anyone has any advice or inside information on how this works please advise. Can't wait to see Cabo but was really hoping to catch a great night at the Cabo Wabo for Sammy's 71st! You can count on at minimum a 24 hour sleep on the sidewalk prior to the onsale to have a chance. I have heard anymore than 75 people in the line your outta luck. We will be in Cabo starting on the 6th of October. We have been trying to get tickets for the 9th of October show. How early should we be there to try and get the dinner show tickets???? Approximately "How many" is a limited number of dinner show tickets?